Take a look at the below depiction. It describes the division of the blade according to Italian and German style fencing from the 16th – 17th centuries. 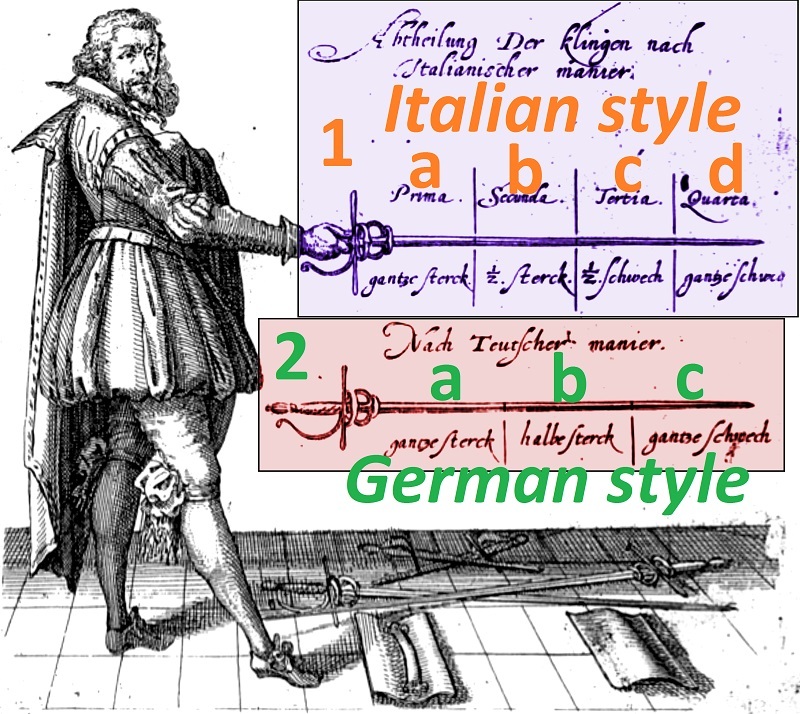 The Italian style has a 4-part-division of the blade, namely in full-strength (1a), half-strength (1b), half-weak (1c), and full-weak (1d). The German style has a 3-part-division of the blade, namely in full-strength (2a), half-strength (2b), and full-weak (2c). From early 17th century German rapier manual. In easy words: in fencing, the blades of the opponents are often connected and an extremely delicate and masterful handicraft is used to feel and push and evade and entrap etc. and to anticipate the opponent’s blade, and act accordingly – before, while, or after. The longer away the point of blade-contact is from your hand, the less power you can apply. It’s that easy and of course you know this, even if you’re not able to tactically apply such knowledge in an actual confrontation (yet). In the Mugai-ryu style of classical Japanese swordplay there is a two-person wooden-sword drill called Hokuto 北斗 (lit. : the Big Dipper). Similar to many other kata in the martial arts, Hokuto is not simply a technique, a combination, or a show of some skill, and most importantly it is not some bravado for the predetermined winner in the set fight, quite on the contrary: It teaches an important concept, in fact the one shown in the above fencing manual. Taking the Italian style as a reference, in Hokuto, the teacher provides the student with a strike, which the student blocks. With the blades remaining connected, both parties now attempt to push the other back – only the teacher uses his full-weak (1d), while the student uses his full-strength (1a). In this way the kata allows the teacher to instruct the student about the importance and execution of this important principle. Note that the teacher is the “loser” in this mock battle. Why? Because he teaches the concept to the student. This is old-style and if you cannot trust and if you cannot lose, you probably cannot be a martial arts teacher in the classical sense. Of course the teacher would have the answer, but first you teach by demonstrating the mistakes and letting the student take advantage of it. That’s also the sole heroic way of teaching, much better than the unworthy but often seen act of bending and nudging the poor pupil’s bodies into various grotesque positions and tell them how great they look. FAIL! Well, to continue, you actually don’t see the described action regularly performed in Hokuto, but I am not familiar with the reasons for this lack. Fact is, I see people who just mock push the swords against each others‘ without taking into account any of the above described important principles. In any case, kata are characterized to include such important universal principles – mostly basic physics – and this is what you want to look for, preferably by consulting a knowledgable teacher. Kata are NOT characterized by random series of ever faster techniques in ever deeper stances… Understanding these things is a part of what is sometimes referred to as shingi 神技 or supernatural skill. This very designation shows you – as obvious and logical as it may seem – that obviously back in the days only a few people ever understood such things. And this might also simply be the reason for the emphasis on kihon and kihon and more kihon, as well as hardening and body building, although it is not our fault that those before us simply often didn’t get it, or is it? Naturally, such principles as above are found in bōjutsu and other kobudō as well as in empty-handed kata. Once you think about it, you will recognize it is everywhere. It is just, you rarely hear about it. Tell me, when exactly did your sensei explain this to you? Or is your rank still too low for such a secret? 😀 Forget it: most of it you know already yourself, it just needs be activated by demonstration! Such are the things you work on in the kata and try to implement in kumite (i.e. kata bunkai, not sundome shiai-kumite). And this is what is transported in the specific kihon of specific schools. And this is why there are indeed traditions and schools (ryūha) in martial arts. This entry was posted in Misc and tagged Hokuto, Mugai-ryu, shingi, 北斗, 神技. Bookmark the permalink.